How I Met Your Mother Finale Thoughts: Why?!? Last night, CBS aired the much-anticipated How I Met Your Mother series finale. After spending this entire season celebrating Barney and Robin's wedding, it was crushing to watch their marriage crumble not 10 minutes later. Viewers had already watched them break up once before. Why put us through it again? One moment we're seeing Barney dance with his new bride, looking as happy as he'd ever been... three years later, but only mere moments on screen, call it quits. Why spend so much time making us care about this couple only to ruin them? It was completely disheartening. On the upside, we loved that Barney eventually found the love of his life in his baby daughter. Watching how that little girl changed Barney was one of the highlights of the finale. We just wish the mother could have been someone he cared about instead of the faceless #31. Moreover, after nine seasons of having Ted search for the love of his life, we only got a few short scenes before they killed here off. Why?!? We understand that things happen in life, but this is a comedy about the trials of finding true love. We took this journey with Ted and the scene of the two of them meeting on that rainy train platform under the yellow umbrella was beautiful. In the end, we couldn't help but feel cheated that we - and Ted - didn't get more time. When Ted finally finishes his story about their mother, his kids tell him to go for it with Aunt Robin. What?!? Yes, for the kids it's been six years since their mom died. It makes sense. But for the audience, it's been 30 seconds. After hearing this story for so long, that ending was as dismaying as it was jarring. From what we hear, the creators of the show had this ending planned all along and Ted an Robin getting back together may have worked in season three or four. But by How I Met Your Mother season 9, they'd long convinced us that this pairing wouldn't work. 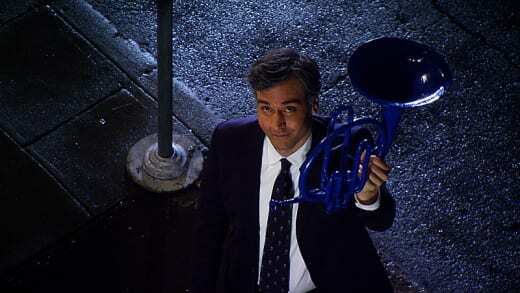 So as Ted stood outside Robin's window with the same French horn so many years later, we were left asking, why? Your turn, TV Fanatics. What did you think of the How I Met Your Mother series finale? I loved it! I wasn't at all happy with that ending. It wasn't what I expected but I'm OK with the ending. I hated it so much I may never watch the reruns again. If it wasn't going to happen with Robin, then it's not going to happen with anyone. Permalink: If it wasn't going to happen with Robin, then it's not going to happen with anyone.